VietNamNet Bridge - The fact that 80 percent of students got scores below average in English at the high school finals clearly shows the inefficiency of the program on teaching English at general schools, according to Ngo Thi Minh, deputy chair of the National Assembly’s Committee for Culture, Education, the Youth and Children. Many high school graduates cannot communicate in English and a high percentage of college graduates cannot use English fluently in their work. At present, students learn English for seven out of 12 years of general education, starting in sixth grade and finishing in 12th grade. With three English periods a week, they have 700 periods of English during the general education years. Deputy director of the Secondary Education Department under the Ministry of Education and Training (MOET), Nguyen Xuan Thanh, believes that 700 periods are too few for students to practice their English. To solve the problem, the new general education program has designed a 10-year English learning process. Students will learn in English in 3rd-12th grades, with 1,295 periods in total, including 140 periods a year for primary and secondary schools and 105 periods a year for high schools. Meanwhile, students only can begin learning English when they enter the sixth grade, which is a shortcoming of the current program affecting students’ learning abilities. MOET has doubled English learning time. Students begin learning English from the third grade as a compulsory learning subject. First grade students can also choose English as an optional subject. “Under the new education program, students will have more English lessons and will begin learning English sooner. This, plus the renovation of English teaching methods, are expected to effectively improve students’ English skills,” Thanh said in an interview to Tien Phong. Meanwhile, some experts question the solution applied by MOET. They said in order to help students learn English better, it is necessary to create an environment for children to practice and communicate in English everyday. The increase in number of English periods alone won’t bring the desired effects. 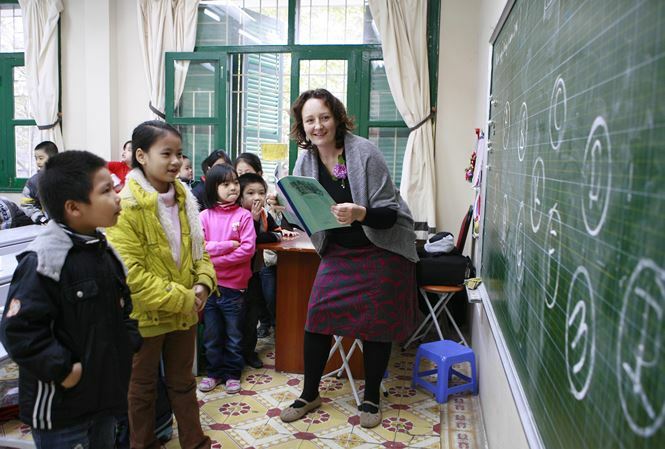 In reply, Thanh said that teachers of English, depending on their conditions, can use different instruments and lesson materials to organize English lessons in the best possible ways. He said students should be shown how to get knowledge from textbooks and apply knowledge. The lessons in the new English curriculum are designed in a way to facilitate students’ application of knowledge in daily life at school and at home. The new English curriculum focuses on helping students improve communication skills in English. Students will practice to develop all four English skills – listening, speaking, reading and writing.